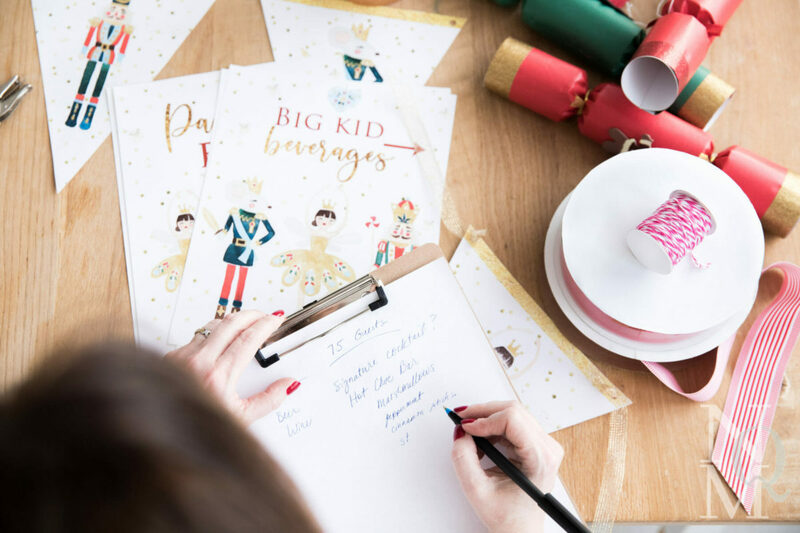 No Qualms Mom Party Principle #1: Invitations and other Paper Décor are easy and affordable yet big impact items: maximize them to elevate your event. the impact of Welcome signs, Food Bar or individual place card food signs is huge and they literally take just a few minutes. For electronic invitations, just insert the image into Evite or Paperless Post instead of using a generic option. Invitations and coordinating party items set the tone of the whole event, and paper extras like banners and water bottle labels are so dang easy to do ahead of time! It’s a fantastic investment at very little cost. A huge suite of signs, banners, and more is that they will cost less than one floral arrangement! The holiday open house suite I’m working on above is a great example of a well-planned (and darling!) invite and decoration suite that was achieved by a couple of emails with the graphic designer Kim Archer of Little Birdie Prints. PRO TIP from Little Birdie Prints: use the comment section before you check out to give clear instructions and then follow up with a message if you’re asking for anything beyond simple details. The back and forth messages take time and can delay your project multiple days. Another NQM tip is to add drink labels for water bottles or stickers that print on to standard Avery brand label templates then order the labels from Amazon and voila! You’ve helped your guests out in a big way since both kids and grown up party goers alike are notorious for taking a few sips of a drink, setting it down and forgetting which drink is theirs. Bonus: this will save lots of plastic water bottles and paper cups from the landfill! Look for a designer like Kim that offers bottle labels or stickers as part of their party package. If they don’t, I’m 99% sure they’ll make one for you that’s custom at a low cost. No Qualms Mom Party Principle #2: Details count so think through the party from your guest’s perspective from arrival to departure. Send a reminder text or email with your address and key details. I usually don’t use email reminders from Evite because people often overlook these but Evite now offers group text messaging. But if you’ve emailed through Paperless Post and Evite, keep it up as they do make it easy so decide what’s best for your friends and family. One key oversight is forgetting to let guests know ahead of time what to expect. I’d strongly encourage this info in the initial invite yet it’s good to repeat it in your reminder. Is it an indoor/outdoor S’mores night? Or a time to pull out their holiday finery? Is it a firm start time because you’re going caroling beforehand? Include land marks in your reminder and mention if you are putting out a roadside sign, balloons or a snow man blow up at the base of your driveway. If it’s not obvious where to park and/or enter your house, tell them or put a sign up. For instance, my house has an odd assortment of doors so I always use Welcome signs to guide people to correct front door. Think through and communicate best solutions to coat and purse storage (verbally or with a sign). If it’s a closet, remove enough of your every day items to allow for all guests and add extra hangers. Maybe a portable rolling rack is the best answer (the can be rented) or move your coat rack to a spare bedroom or office so purses can be placed near coats. Do not overlook key bathroom issues. Stock and store in a visible spot extra TP and hand towels. Check soap levels, empty bathroom trashcans so that they’re not overflowing by party’s end. In the kitchen and where ever else it’s logical, place all trashcans and recycling bins in visible spots or put large signs on their cabinet locations. Be sure to note which bin is trash, recycling, and compost. Have an appropriate playlist on at a volume that best fits the crowd and vibe of the party. Stress on the word appropriate – tempo counts. A mellow dinner party should have mellow music and a big open house should have upbeat music whether that’s holiday tunes, Sinatra lounge sound, or the latest pop mix. Consider using basic signs inside your house. In the event that all your guests aren’t familiar with your house, and the party is larger than a few couples, use directional signs like Bathroom, Coats, Bar, etc. We have multiple bathrooms so I post directional signs if we’re entertaining a crowd. If it’s a sit-down dinner there is a moment of anxiety when people wonder where they should sit so help them out: either be present to politely direct people to the seating arrangement you’d like or use cute place cards. Seating arrangment is one of the most common oversights and it significantly affects the fun and level of interesting conversation at a party. Also, I’d strongly recommend splitting couples and best friends up. Consider what will happen after the meal. Are you going to go sit by your outside fire? If so, have a basket of throw blankets. Are you going to play a fun game? Have a stack of a few crowd friendly options waiting in your living room. Last but not least, thank them for coming! They added to your party’s success and expressing gratitude for the time and company is a very important party of hosting. No Qualms Mom #1 Party Killer: Cleaning up! I cannot stress this enough. Unless you have the kind of kitchen that is very separate from your guests and allows for you to quickly and quietly scrap, rinse and load in the dishwasher, DO NOT DO YOUR DISHES! Unless, that is, you want your guests to put the brakes on the rhythm and mood of the party. It’ll literally stop fun conversations as guests will feel compelled to help you clean or they’ll take it as a signal that the party is over!!! If you did hire someone to help with catering or service, they can certainly clean up provided it can be done quietly. But since having paid helper is not the case for most parties, we often feel the need to get the gross dishes cleaned up. Yet, restrain yourself! The moment when the hostess or host (or even another key party goer) steps away, it signals a change in pace and mood. Instead, just clear table (or go to another room and leave dishes there) and continue with the party. Politely decline guests offer to help. It invariably happens to think through how you’ll say no ahead of time. I generally joke that it’s against my religion to clean during a party or say that I have hard and fast rule against it. When we lived in a smaller house, I used plastic bins and restaurant bus tubs to stack dishes and store them out of sight quickly. And I’ve shoved plenty a pot and pan into my oven. The caveat to this rule is big family meals.You can judge this rule based on the crowd and the mood. Often times, these gatherings are more of a long haul event, so a break after a big meal can be welcomed. And I guess the last rule is to just relax and have fun! You’ll be able to do this very easily now because you’ve thought of your guests’ every needs! Cheers to a wonderful holiday party!